Amid Opposition, Planning Continues for Obama Presidential Center in Chicago - Integration Through Media ....! (VOA): Just a few miles from the South Side Chicago neighborhood former president Barack Obama called home for nearly a quarter century, he spoke to a mostly supportive audience at McCormick Place Convention Center about his plans to give back to his adopted hometown. “We’ve got a plan where over the next four years we are going to create $3 billion worth of economic activity. We are going to create over 5,000 jobs just in the construction, 2,500 jobs that will be permanent and ongoing,” he told the crowd at the start of his latest public meeting about the project. Though born in Hawaii, raised in Indonesia, and educated in New York City, former president Barack Obama has adopted the city of Chicago, his wife’s birthplace, as his hometown, and the South Side of Chicago is where he got his start in politics as a community organizer in the 1980s, making it a logical location for the facility that will preserve his legacy. 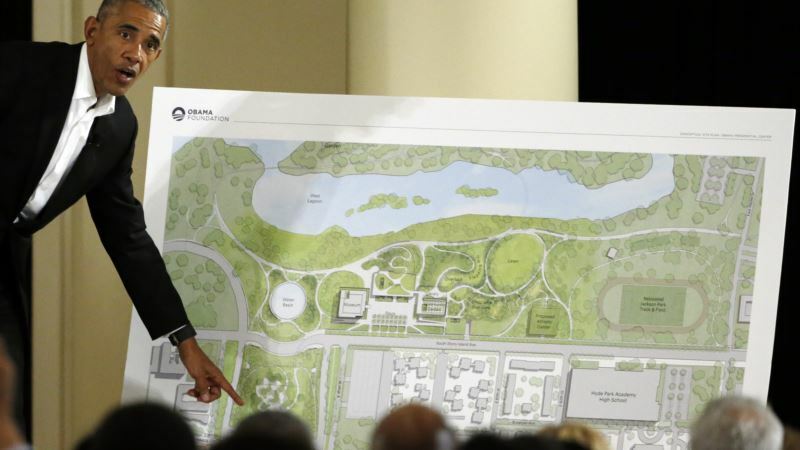 Current plans for the estimated $300 million Obama Presidential Center place it at historic Jackson Park, designed and developed by the famous landscape architect Frederick Law Olmsted in the late 19th century, near Lake Michigan. The roughly twenty-acre campus would include a variety of different spaces the community could utilize with a large tower looming over the site as the centerpiece, which would house the Obama Presidential Museum. “It’s estimated we might have as many as 700,000 people just going through the museum portion of this,” Obama explained. “We are going to be able to make this a jewel not just for the South Side but for the entire city of Chicago.” ‘Tone deaf’ But not everyone on the South Side of Chicago is sold on the project. “I think over the past year since he was President he has to some extent forgotten the neighborhood where he started out as a community organizer, “ says professor W.J.T. Mitchell who works for Obama’s former employer, the University of Chicago. Mitchell is one of 200 members of the faculty that recently signed a letter criticizing plans for the Obama Presidential Center at Jackson Park, not far from the University’s campus. “It has to be shoehorned into a relatively small space that is already highly developed,” Mitchell told VOA from his campus office. “It’s not adjacent to a commercial strip. Across the street is a high school and another school associated with the University. It’s being shoehorned into an already highly developed historic space.” Mitchell, who would also like to see a “Community Benefits Agreement” with the Obama Foundation guaranteeing certain aspects of the development of the project would benefit the neighboring community, is an unlikely critic as he he considers himself a friend of the Obamas. “We were part of the same social circle of faculty and neighbors,” he explained. “We had Thanksgiving dinner with them occasionally.” Despite that connection, he feels the Obama’s have been “tone deaf” in developing the Presidential Center. He says despite “breakout sessions” at public meetings, there has not been enough public input. “There’s no public discussion where the community can say we have real doubts about this aspect,” he says. “They’ve been marketing it all along, and I think that in itself produced a kind of resistance. People don’t like being sold under the rubric of ‘we want your input.’” ‘Face-to-face’ meetings urged Mitchell says he is supportive of the project being located somewhere on the South Side of Chicago, though not Jackson Park, and believes there would be less opposition and concern to the plan if Obama was more present in the neighborhood throughout the development process. “It would be really great if he would come back and spend some time talking to people face-to-face and not on jumbotrons, and not in huge auditoriums but actually meeting with small groups around the neighborhoods. He would learn something.” “What I want to do is make sure that everyone is represented,” Obama explained to the crowd at McCormick Place, and noted he was aware of the many criticisms of the project. He reiterated his intentions were to ultimately help the residents who live on the South Side. “We’re not coming in here as a for-profit organization,” he said. “I’m out there raising a bunch of money to get this thing built… to get this thing up and running, and I’m not taking a salary from the foundation, and Michelle and my motivations are entirely to make sure that the community benefits.” Benefits that could ultimately transform Chicago’s South Side, which has more recently earned a reputation for its vacant buildings and increased crime… something Obama hopes his Presidential Center can change, which is currently slated for completion – if the plans are approved – sometime in 2021.